The warmth of a big mug of hot chocolate with tons of marshmallows and a little secret spice in a cookie form. It is now the time of the year where I want to try hot chocolate because it is starting to feel like Winter. In my neck of the woods the highs been in the 60's and the lows in the 40's so that is my Autumn and the beginning of Winter. For me, I like my hot chocolate to be super chocolatey maybe a little spice like cinnamon with whipped cream and/or mini marshmallows, not too hot so it doesn't burn my tongue and made with milk not water like they say on the package. How do you like your hot chocolate? Let me know in the comments. 1. In a medium size saucepot, bring unsalted butter, sugar, vanilla extract and baking cocoa to a low boil for 5 minutes. Let it cool for 10 to 15 minutes before adding eggs. 2. In a separate bowl, whisk together 2 cups of flour, baking soda, baking powder, sea salt and cinnamon. Fold in cocoa mixtures to the flour. 3. Toss chocolate chips and dried marshmallows in the 1/2 cup of flour then fold in cocoa-flour mixture. 4. Cover and chill for at least 2 hours, I suggest let it chill longer. 5. Preheat oven to 325 degrees. Line cookies sheets with parchment paper. Scoop cookie dough with a cookie scoop or two tablespoons. 6. Bake for 8 to 10 minutes. Rotate halfway through baking. Let the cookies cool for 10 minutes on the cookie sheet then transfer to wired rack and it cool completely before consuming. Store in a cool place in an airtight container. I personally love my hot cocoa with LOTS of mini marshmallows... And whipped cream! YUM! Me and my kids love baking and these looks so delicious. Im going top make them for ourselves. I think chocolate and cinnamon is such a great combination, thanks for sharing this, it looks amazing! I love anything hot chocolate. Super yummy cookies! Wow!! This is what I am looking for. This hot chocolate cookies looks delightful and really tasty. It makes me craves for this cookies. Lol!! I am looking to try this recipe. It's getting so cold here in the UK and I could do with about 20 of these to warm my soul!! Looks SO tasty!! I've never eaten something like that. This recipe is ideal for upcoming holidays! Especially, for the kids. I'll save this recipe. Sweet Salty Comments: I like my chocolate hot, and chocolate. Preferably, in a cup large enough to stick my head in �� Yum! These look delicious! I love making hot cocoa at home. We practically live off of it. :) These look very comforting and maybe too tempting lol. I love my hot chocolate in winter while cozying up with a good mystery book on my favorite couch in my warm home. I've never had it with cinnamon though, so that's something I'll have to try real soon. these chocolates looks delicious and pictures are mouth watering. Wow! These cookies look delicious. I love brownies topped with a dollop of ice cream. In fact my mouth is watering as I type...ha..ha.. Thanks for sharing the recipe. Mmm these look and sound totally delicious! I must try and make them! Chocolate and Cinnamon is a great combination. Hot chocolate cookies sound so good and I like the way you have presented it. These look amazing! As soon as it turns cold here (ahhhh southern weather) me and the kids will make them. Looks and sounds like the perfect winter cookie. 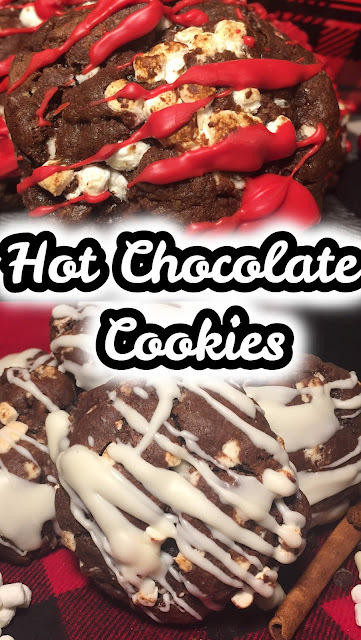 I love hot chocolate of any kind and these cookies sound fantastic!! I don't think they would last long in my house! I might have to make a double batch! Thanks for this recipe! These look yummy! Perfect to make for Christmas!! These look absolutely delicious and so melt in the mouth! These cookies look so good! I totally want to make these. Whoa How tempting! They look good and attractive. Sure a big hit with kids.